It doesn’t matter if I have to fit into a fancy dress, see distant cousins I haven’t seen in years or take a nice family photo that will stay on fireplaces of every family member we know for the next ten years. Not even exercising every day, having nothing but salads for a week and avoiding sugar like the plague can stop me. There’s always one thing I want to do during the holidays. Mr. Crumbs wants to make cookies? Sure – why not? That way I don’t feel as guilty when I eat two. It’s inevitable. I want something sweet, and something sweet wants me. There really is no point in denying it (or myself), so I’ve come up with a way to have my cake and eat it too. Or should I say fudge… Better yet, homemade pumpkin fudge. Last year I created a homemade peppermint fudge recipe that was SO easy and SO good, that I couldn’t help but make it even when the holidays were long gone. 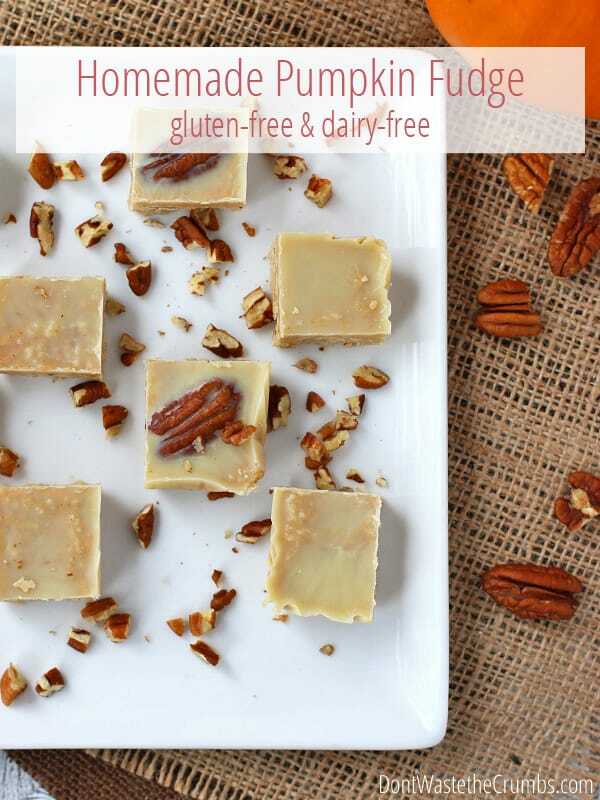 Actually, that recipe (and now this homemade pumpkin fudge recipe too) are the only reasons I buy coconut cream concentrate from Tropical Traditions… when they’re buy one get one free, of course. It’s easy. So, so easy. Melt, stir and pour. Done. It’s made with ingredients I normally have on hand. Coconut cream concentrate is the oddball of them all, but I really like having it on hand. Besides, it takes me eons to go through the two quarts. Once a year I buy them on sale and call it done. It looks so fancy! Homemade pumpkin fudge? Say it isn’t so. Guests will ooh and ahh over your dessert and you can sit back and accept the compliments with a smile. It’s PERFECT for parties! See “it looks so fancy” comment above. It can be made ahead of time. Like, MANY days ahead of time. In fact, I’d go as far to say a week, so long as you can refrain yourself (and the family) from pecking away at the container one delicious piece at a time. It’s naturally gluten-free and dairy-free. Choose your chocolate carefully and you can make it soy-free too. It’s not overly sweet. Yes, I want something sweet, but I don’t want to feel like I’ve just eaten a half pound of sugar. It has just the hint of sweet to satisfy the craving without ruining dinner. It’s not overly pumpkin. It’s the perfect balance between dessert, pumpkin and chocolate. Yet it still tastes 100% like holiday. Oh yeah, since this homemade pumpkin fudge is half fruits and vegetables,I consider it fairly healthy. Ha! As if I needed an excuse to eat it for breakfast. In a double boiler over medium heat, melt chocolate and coconut cream concentrate while stirring occasionally. Meanwhile, prepare your mold by lining the bottom and sides with plastic wrap, allowing extra to hang over as "handles" as you un-mold. When most of the mixture is melted, reduce heat to low and add pumpkin puree, spices and salt. Mix well. Turn the heat off and add the vanilla, stirring well to incorporate. Carefully pour the mixture into the mold and gently tap the sides to create a flat surface. 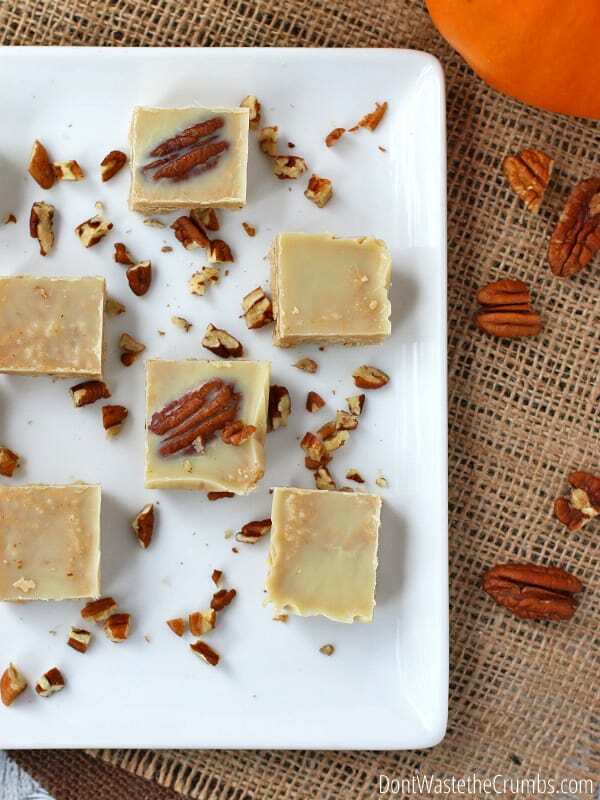 If desired, sprinkle whole or chopped pecans on top, pressing just lightly into the fudge. Allow to cool in the fridge for at least one hour before serving. Remove the fudge and container from the fridge and allow to come to room temperature for about five minutes. On a cutting board and using a serrated knife (NOT a chef's knife), press down to cut into approximate 1" squares, or other similar size depending on the mold you used. You can make this with other chocolates too. Simply substitute semi-sweet, milk or dark chocolate for the white chocolate and follow the rest of the directions as written. Adding salt at the end of the homemade pumpkin fudge recipe, gives the fudge a definitely “salt” taste, which compliments the sweetness of the fudge incredibly well. If you’d like the salt to be less obvious, add it at the beginning when you’re melting the chocolate and coconut cream concentrate. I prefer to use mini-loaf pans like these to make fudge, especially since I already have them on hand for mini-loaves of bread, granola bars and quick breads for gifts. A full batch (as written above) will create tall fudge (like the homemade peppermint fudge), while a half batch will create a slightly shorter fudge. Both are delicious, so judge size based on how rich the fudge will turn out. If you don’t have mini-loaf pans, an 8″x8″ glass dish would work just as well. 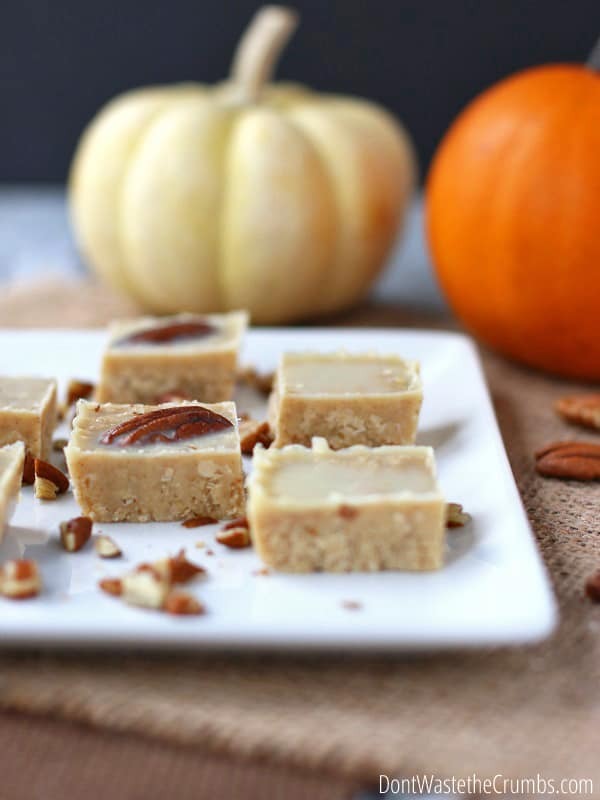 Even though I love this homemade pumpkin fudge, I enjoy experimenting with new flavors – what’s your favorite flavor of fudge? Where do you find dairy free white chips? I tried this and it didn’t set at all. I didn’t have the good stuff so I used canned coconut cream from Trader Joe’s, but I only used the top part that was thick and not the runny stuff. It’s been in the fridge 24 hours now and it’s still sort of runny, like a pudding. The flavor is good, but I’m disappointed it didn’t turn into fudge for me. Hi Allison – The canned coconut cream from Trader Joe’s isn’t quite the same as the product I used in this recipe. I believe that product is the thicker portion that solidifies at the top of coconut milk, where in the recipe I’m using coconut cream that’s made from the pulp of the coconut itself. Essentially TJ’s product is high in water where real coconut cream is very low in water. If it’s runny like a pudding, I’d suggest serving it as such! What if you put it in small ramekins, topped with brown sugar and caramelized it? That would be WAY good! These look marvelous! Just wondering if I can sub the white chocolate for cacao butter and add some maple syrup or coconut sugar for sweetness. Would love your thoughts on this. Thanks! when I click on the link it shows me coconut oil. Is there a difference between coconut cream concentrate (coconut butter) and coconut oil?